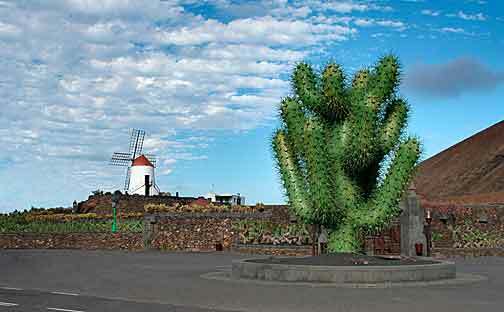 The Cactus Garden is a magnificent example of an integrated architectural intervention in the landscape. Cesar Manrique makes this bold architectural complex binomial maintaining unwavering art and nature that permeates all space operations. 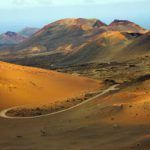 The choice of this privileged environment, as in so many works of Manrique, conditions both aesthetic solutions adopted as the contents thereof, which have a sense of continuity and integration with the surrounding landscape. Stand outside the large metal cactus entry and wrought-iron gate as singular referential and symbolic elements that make us divine the majestic character and surprising interior. 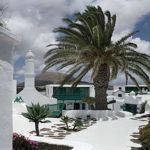 The Cactus Garden is located in the town of Guatiza, municipality of Teguise, in the center of an agricultural environment characterized by large cactus plantations for the cultivation of cochineal. 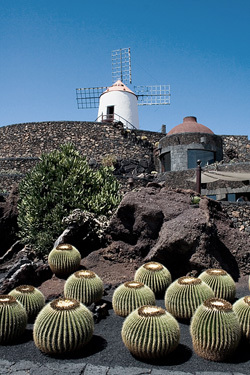 The origins of the Cactus Garden is back to the seventies of the twentieth century, when Cesar Manrique, in the creative dialogue with the island landscape, takes a look at the old rock quarry Guatiza volcanic ash. 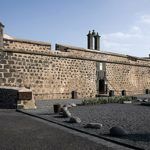 The artist encourages the Cabildo of Lanzarote, with whom he works closely, purchase the land, walled complex and restore the traditional mill which crowns the campus. However, owing to various vicissitudes, it will be necessary to wait for the eighties to develop the original project to build a new Center for Art, Culture and Tourism. 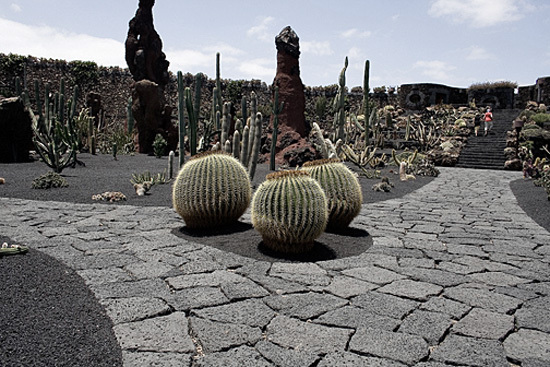 The Cactus Garden was finally opened in 1990 and becomes the latest spatial work of Cesar Manrique in Lanzarote. In the “blades” of the cactus (also known as prickly pears or cactus) is grown a parasitic insect called cochineal (Coccus Dactylopius) which, after careful manufacturing process, you get an intense carmine dye. Traditionally used as textile dyeing, now this natural dye is highly prized in the food industry and cosmetics. 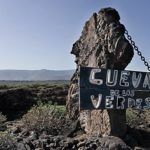 While in the plain of Guatiza find the largest area of cultivation of cochineal in the Canary Islands, is a culture in decline due to competition in the market for industrial synthetic dyes. The entry consists of a labyrinthine set of robust volumes curved around a central structure in the form of “taro” (stone building aimed at curing the cheese and also used by shepherds to guard the livestock) is hiding under insight and lead to a surprise effect on the visitor. Through the door we find a general overview of the entire building. The interior has a circular structure, metaphor possible crater island. 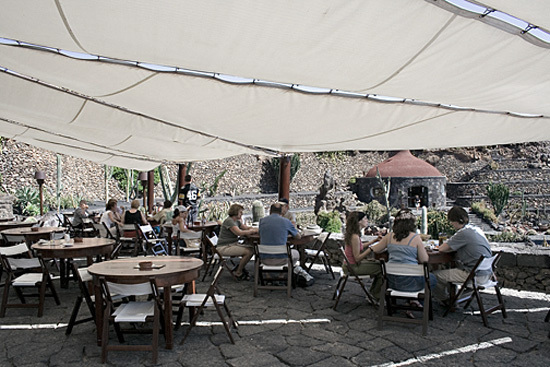 One of the main features of the amphitheater are recreated walls, terraces formed by descendants of ground, stands in way of exhibiting the different varieties of cactus. At our feet, opening a double staircase that invites us to walk the winding cobbled paths and stairways that connect the different areas of the interior garden. Natural mating, aesthetically beautiful, forces us to pay attention to where we stand. In the center of the scene we see a series of lava stones compacted monoliths that have been left untouched as evidence of past mining activity. Sculpture of character, these ribs organic blend with the whimsical and original forms of the cactus. In the five thousand square meters of the center there are more than seven thousand two hundred copies of over one hundred thousand different species, originating from places as disparate as Peru, Mexico, Chile, USA, Kenya, Tanzania, Madagascar, Morocco and Canary Islands. 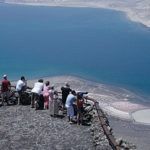 It should be noted that the collection Cactus Botanical Garden continues to grow with new plantations regular especies.Como idyllic counterpoint to the arid landscape, there are smallenas lagoons filled with water lilies and goldfish. The use of building materials in the environment, the continued use of curved lines, the absence of symmetries that are not natural, pure forms concave (gullies) and convex (hills). All resources more refined aesthetic landscaping we try to give the impression that the whole is a work of nature, just tapped by man. Camouflaged on the wall include two buildings of great size, whose main feature is the dome-shaped roof: one designed to store (the local crafts) and the other the cafeteria of the Centre (which includes menus combined value for price). Within the last we see the elegant spiral staircase and central sculpture (made of steel branches and glass floats like a chained molecules) that emerges from a small fountain. The different artistic disciplines come together in this unique space in an attempt to play an educational role totalizing. 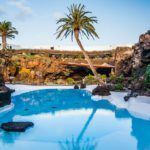 Sculpture, painting, architecture… César Manrique has different stimuli for the visitor to experience a close and rewarding. A striking number of innovative auxiliary equipment (lamps, doorknobs, paper, etc..) That are inside and have nothing to do with conventional models. Designed exclusively for the garden, keep a close similarity to the cactus that they accompany.